Following your flight from Dublin, you will be transferred to the port where your ship will be waiting. It seems unlikely that a character named “Gassy Jack” Deighton would be responsible for one of the most beautiful cities on the continent. But that’s history for you. Within a 20 mile radius, one can see dozens of exciting attractions including Fort Stevens State Park, Fort Astoria, Heritage Center Museum, Flavel House Museum, Uppertown Fire Fighters Museum, Astoria Column and the Columbia River Maritime Museum, home to one of the nation’s finest displays of model ships and nautical artifacts. “Welcome to Paradise,” is a fitting expression for those visiting the coastal city of Santa Barbara. Called the American Riviera, Santa Barbara is a place where food, art, history, fashion, wine and sunshine mix to create a delightful and unique experience for the visitor. Charming Spanish and Moorish style buildings graced by brilliantly-colored bougainvillea, palm-lined beaches, a warm Mediterranean climate, charming sidewalk cafés and a pristine seaside setting are some of the aesthetic reasons for visiting Santa Barbara. The “Queen of the Missions,” Santa Barbara’s Old Mission can be traced back to the 1700’s when the mission was built to bring Christianity to the Chumash Indians. The Old Mission is now a California Historical Landmark and is one of the most popular attractions in the area. Puerto Vallarta was sleepy no more; its transformation into an international resort had begun. Then director John Huston chose the village as the location for his film “Night of the Iguana,” starring Richard Burton. Today, the city has its own “Gringo Gulch,” a haunt of the rich and famous. Travelers are also drawn by its climate, its excellent shopping – which offers great values on leather goods, jewelry, and handicrafts – and mile after mile of palm-lined beaches. Nine bays bordered by 36 golden-sand beaches form the beautiful Las Bahias de Huatulco in the state of Oaxaca. Welcome to Mexico’s newest resort on the Pacific Riviera. Huatulco is a tropical Eden with crystalline waters, coral reefs, and uncrowded beaches. Inland, the rugged coast range is thickly carpeted with rainforest and coffee plantations. While Huatulco is still in its early stages of development, travelers may note that the resort has a different feel from other destinations on the Mexican Riviera. That’s because large areas of Huatulco have been designated as an ecological reserve. Huatulco is located in the state of Oaxaca where the foothills of the Sierra Madre del Sur Mountains meet the Pacific Ocean. Nicaragua is the largest Central American nation and has stunning landscapes, vast cultural treasures, and an intriguing history. Until recent times Nicaragua was unfortunately known for the civil war (Sandinistas and Contras) that raged from the late 70s through much of the 80s. Today, the soldiers and guerrillas have given way sightseeing in a beautiful country. From strolling the cobblestone streets of colonial Granada on Lake Nicaragua, to exploring one of the many volcanoes, Nicaragua has something for even the most seasoned traveler. Note: Due to time constraints in port, some tours may not be available on every voyage. Please refer to your Cruise Personalizer on princess.com for a complete list of tours available during your cruise. Tour content may vary based on the amount of time in port. San Juan del Sur is an anchorage port. Transfer from the ship to shore will be via the ship’s tender transfer. In ports where guests utilize tender boats to go ashore, Princess staff will make every effort to assist but are not allowed to individually physically lift more than 50 lbs. (22kg). Guests requiring physical assistance must travel with an able-bodied companion. With your safety and comfort in mind, the final decision to permit or prohibit passengers from going ashore will be made on each occasion by the ship’s Captain. Hailed as the Switzerland of the Americas, Costa Rica occupies a unique position, lying between two oceans and two continents. On both coasts, tropical rainforests rise to the mountains of the interior, many of which soar over 13,000 feet above sea level. In the west, a seemingly endless succession of brown-sand beaches forms the nation’s Pacific coast. Puntarenas is your gateway to Costa Rica’s wonders – and to its capital city of San Jose. The one-mile causeway was created by connecting four small islands with rocks excavated from the Panama Canal. There are several shops, restaurants, and other specialty stores centered around a large marina that serves as a tender dock. The causeway also affords a panoramic view of Panama City’s impressive skyline and serves as the home for the Smithsonian Institute of Tropical Research. Note: Fuerte Amador is an anchorage port, passengers transfer to shore via ship’s tender. 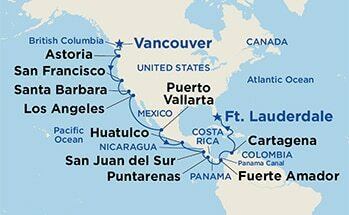 On complete transits of the Panama Canal, the ship typically arrives in Fuerte Amador in the morning, operates tours and spends the full day at anchor. Cruising through the Panama Canal will be one of the unforgettable experiences of your voyage. It takes approximately eight hours to navigate the 50-mile waterway linking the Atlantic and Pacific Oceans, allowing you to experience firsthand one of the engineering marvels of the 20th century. Completed in 1914, the canal marks the culmination of a dream born in 1513, when Balboa became the first European to cross the Isthmus of Panama and sight the Pacific. In 1880 Ferdinand de Lesseps and the French Canal company, builders of the Suez Canal, began construction in Panama, only to be defeated by disease, staggering cost overruns, and massive engineering problems. The French sold their claim and properties to the United States for $40 million, a staggering loss of $247 million on their investment. The United States began construction in 1904, completing the project in 10 years at a cost of $387 million. Building the canal meant solving three problems: engineering, sanitation, and organization. The project, for example, required carving a channel through the Continental Divide and creating the then-largest man-made lake ever built, as well as defeating yellow fever and other tropical maladies. The United States oversaw the operation of the Panama Canal until December 31, 1999, when the Republic of Panama assumed responsibility for the canal’s administration. The Panamanian government controls the canal through the Panama Canal Authority, an independent government agency created for the purpose of managing the canal.